The curriculum for one of the coding classes I teach used to have a meet and greet question that everyone would answer: “what’s your favorite dinosaur”? Without fail, I’d forget to plan for it, and have to wrack my brain for one from Land Before Time or Jurassic Park (those movies being the extent of my familiarity with dinos). I’ve found my new favorite (a bit too late, c’est la vie): the inimitable Winosaur! 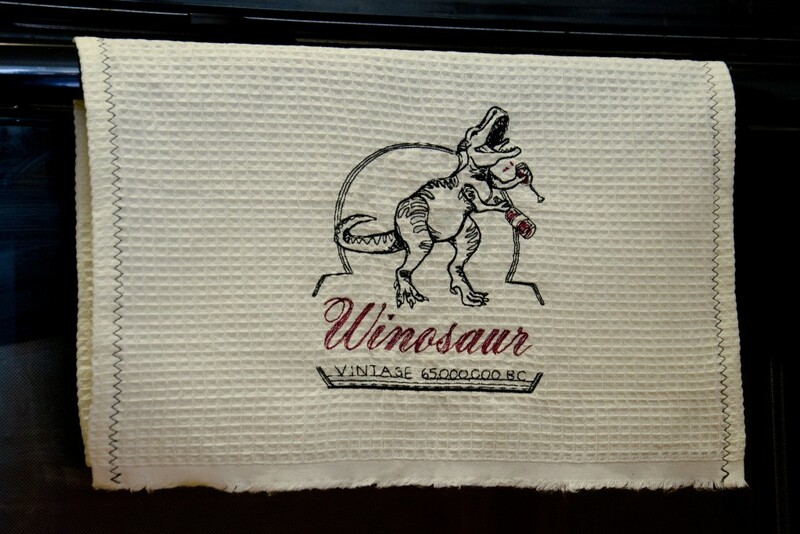 I picked this embroidery up from Urban Threads a while ago, when it was featured as a freebie. 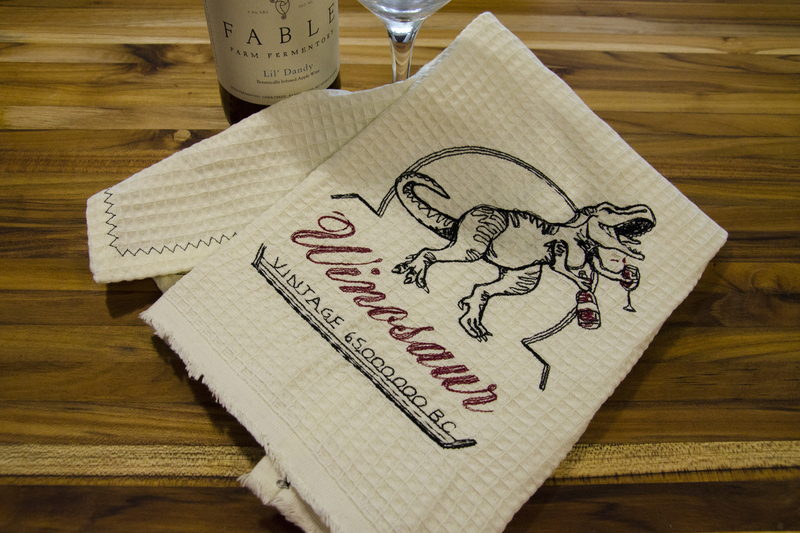 It was perfect for a set of tea towels (wine towels?) to give as a hostess/housewarming gift to friends who recently moved and threw a BBQ. I’m glad that I bought a full yard of the waffle weave fabric I used to make these towels out of, as my first attempt and a half at stitching out the embroidery went awry. Most of this is Machine Embroidery 101-level stuff, but I thought I’d share everything I learned. I tried to cut corners and it bit me, of course. Use a fresh needle. 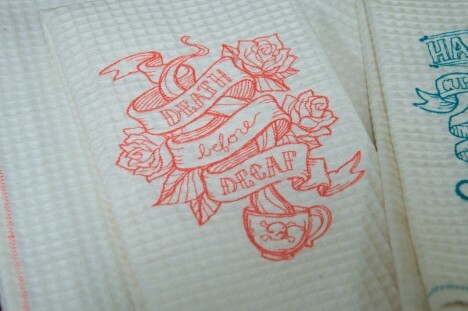 An embroidery one. In the right size. 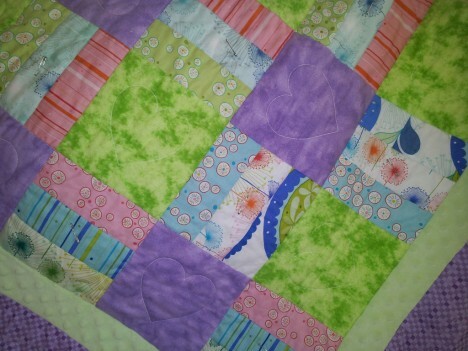 No, that one you just finished using to quilt something is not okay. Buy the right-sized stabilizer. Yes, you may have the right type stashed, but if it’s sized for a smaller hoop, just go buy the right size. Double (or triple) up your water-soluble stabilizer according to their directions, particularly with an unstable fabric and heavy line stitching. 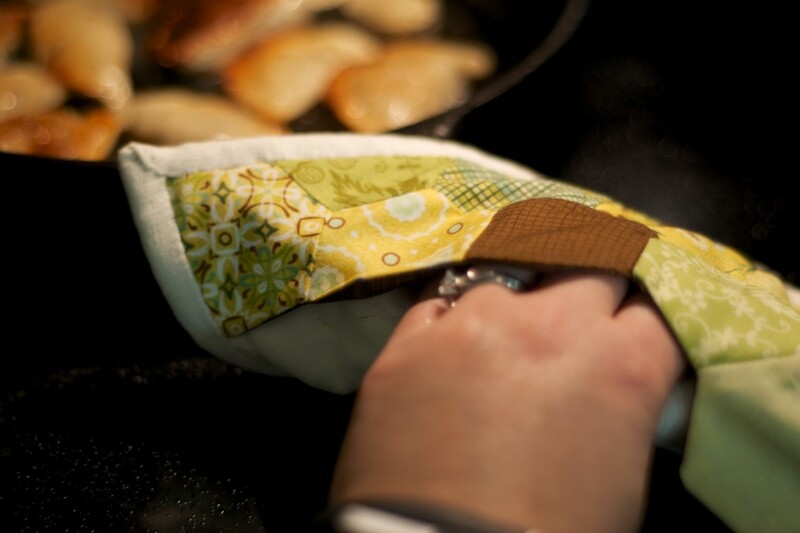 Use spray baste to attach the stabilizer to your fabric. 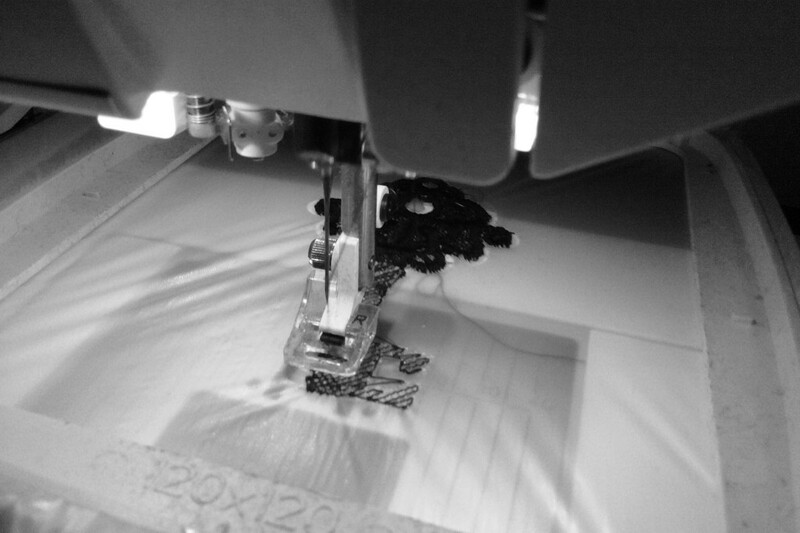 Have your machine baste the design outline before stitching. The Large Metal Hoop, while awesome, doesn’t ship with enough magnets to secure unstable weaves. Steal more from your fridge (TMNT to the rescue! Cowabunga, dudes!). The towels themselves are simple. They’re a fat quarter of waffle weave fabric, hemmed with mitered corners on one short edge, and the fringed selvage left bare for that towel-like look on the other. I used a contrast thread with a zigzag for aesthetics. I couldn’t help making a spare set for myself in the name of ‘testing’ the final product! And by that, I mean I kept the awkward learning curve versions for myself. 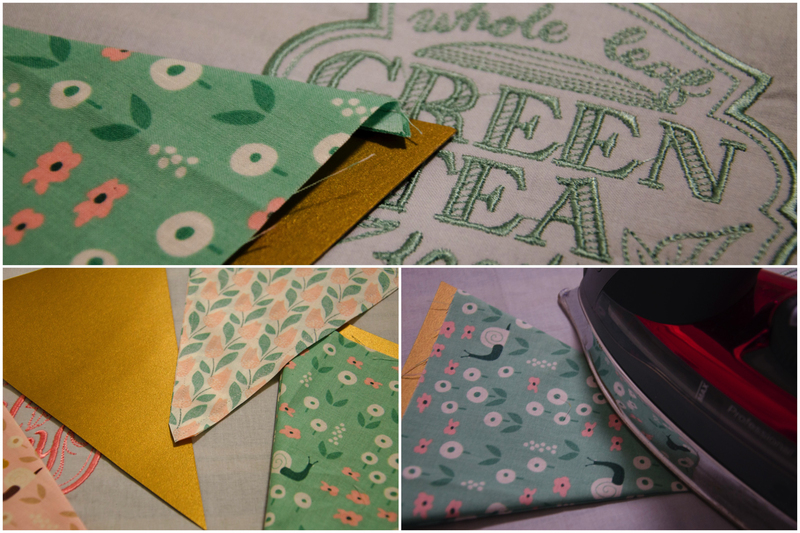 I bought far more fabric than I needed to make the bridal shower tea party bunting (half yard cuts of six prints, a yard of another), so the obvious thing to do was to use some as part of a shower gift for the bride and groom. 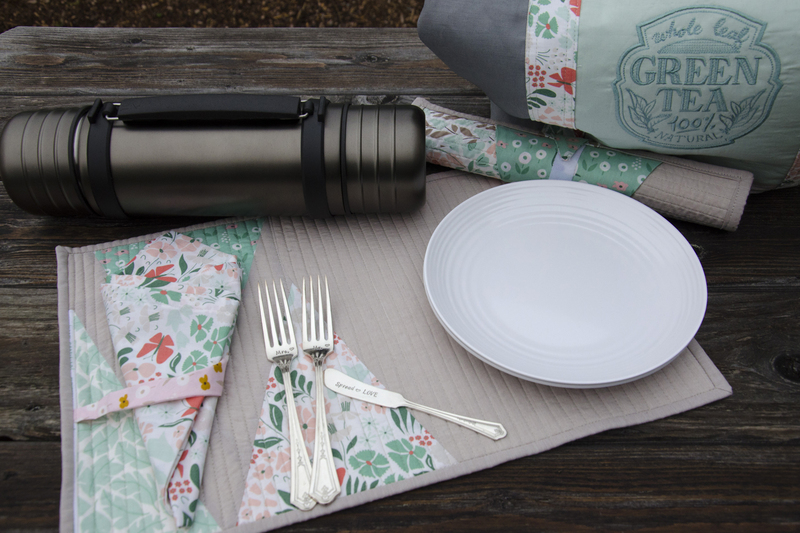 I ended up with a suite of gifts perfect for a picnic at the park. 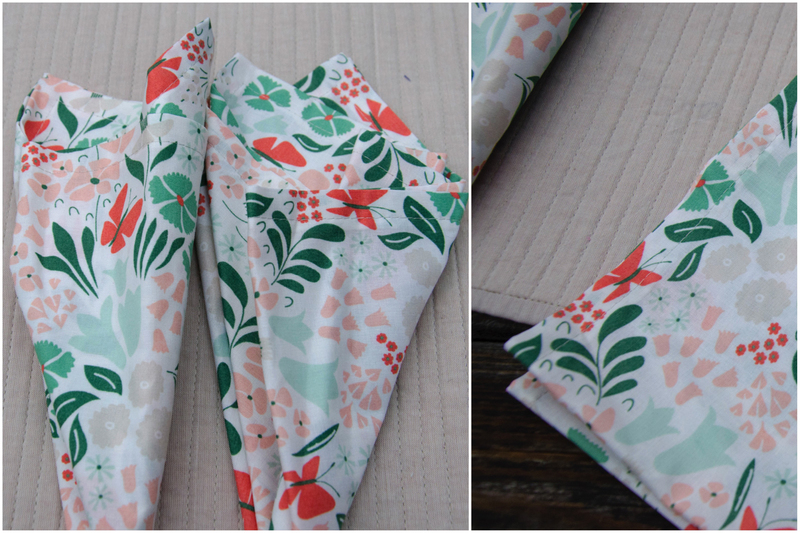 I made a pair of basic mitered-corner napkins using a half yard of fabric. 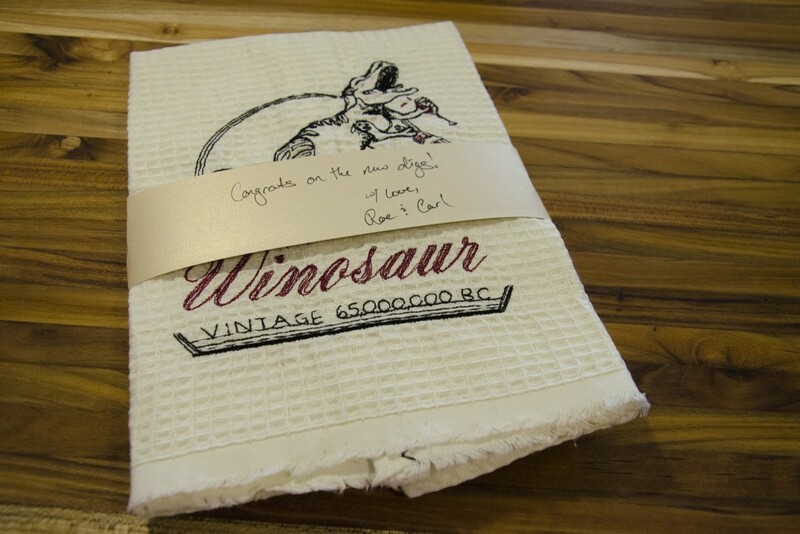 They finished at 17″ square. There are many good mitered corner napkin tutorials online if you need one. I used this one from Purl Soho as a refresher for the corners because I can never recall how to do it properly. 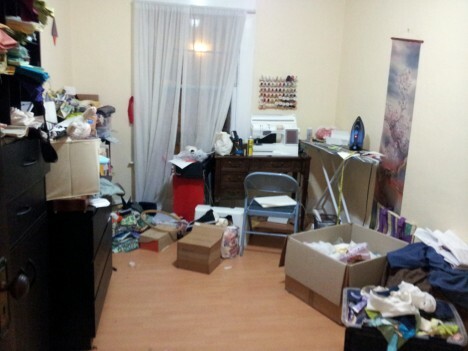 Here’s another one from Craftsy if you don’t want to be sold hard on buying more fabric. 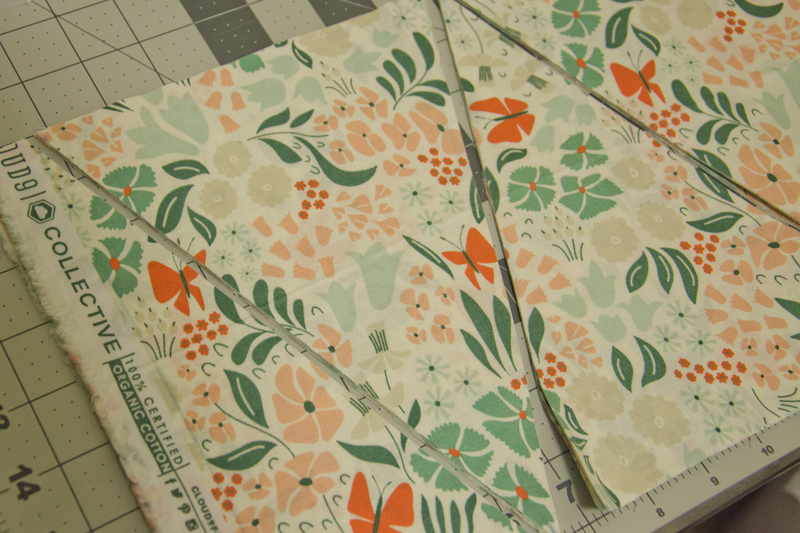 When I cut out bunting pieces, I ended up with extra triangles and end pieces since I simply sliced up a 9″ strip of each fabric. I wanted to use up those pieces in any piecing, so started putting together the placemat design with improvisational piecing taking cues from the triangles. 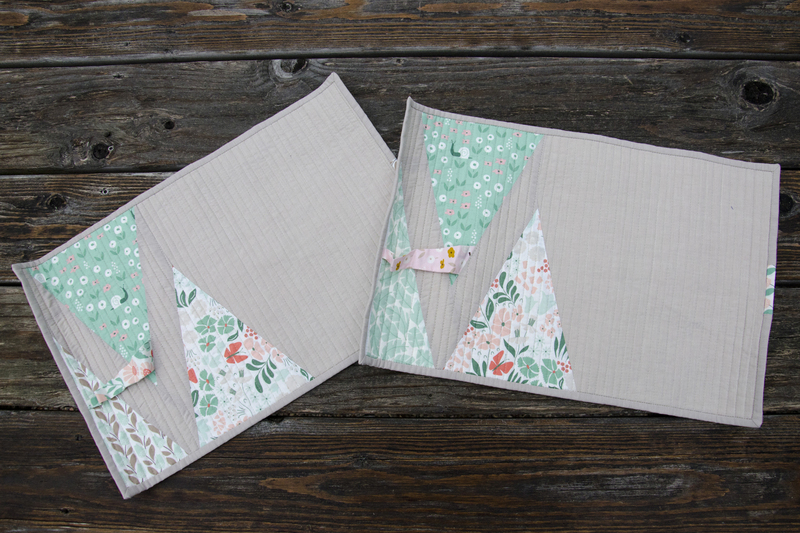 I paired the Park Life prints with Kaffe Fasset Shot Cotton in Latte from my stash—slightly different than the solid gray I used in the bunting, but a better match for the colors in Park Life—it’s a slightly taupe-ish gray. The back is pieced from more triangles and a strip of the gray. 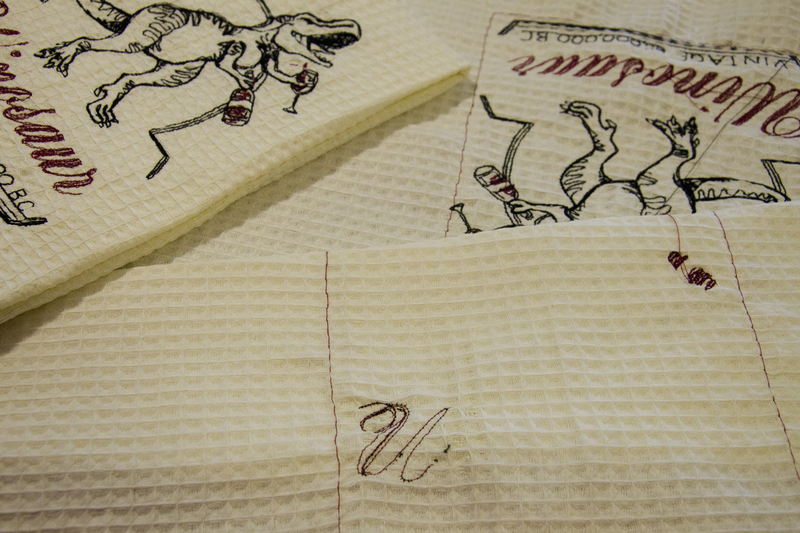 After piecing, I inserted a strip between one piecing seam and the binding that acts as a napkin ring on the front. 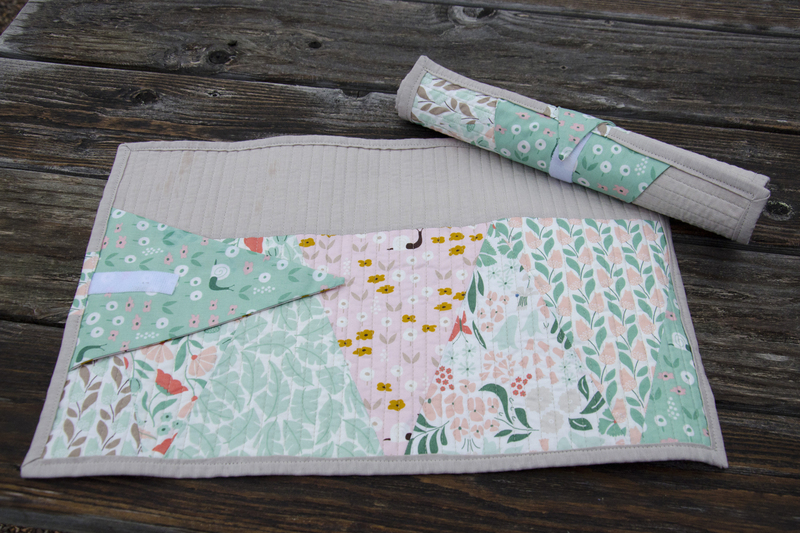 I quilted them in 1/4″ lines with a gray-taupe Aurifil, then bound them in the gray with one small scrap of print to give a bit of visual weight to the right side. Because the intent was that these are portable for a picnic, I tried to figure out a way to secure them while rolled up for easy transportation. Going back to the pile of leftover triangles, I made a pennant, slid it into the binding, and used a bit of Velcro to allow it to fasten flat to the back, or to itself if you roll up the placemat. It turned out to be my favorite feature. 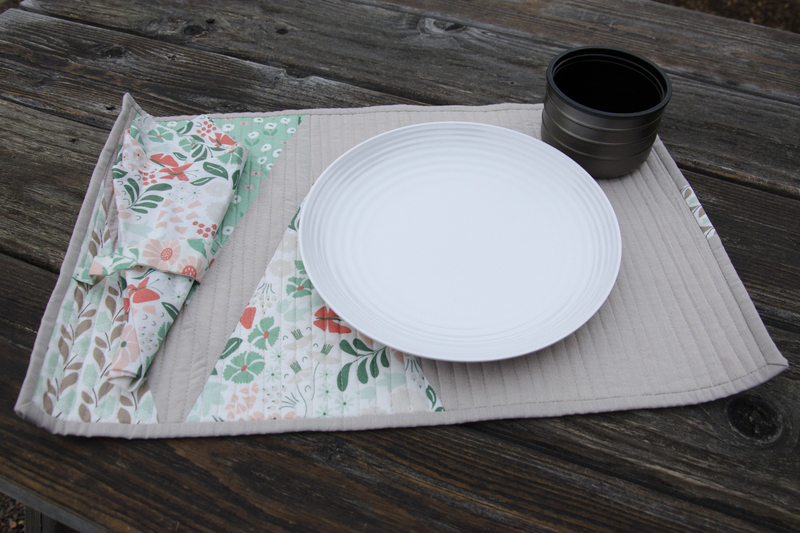 What good are traveling placemats and napkins if you’ve nothing to carry them in? 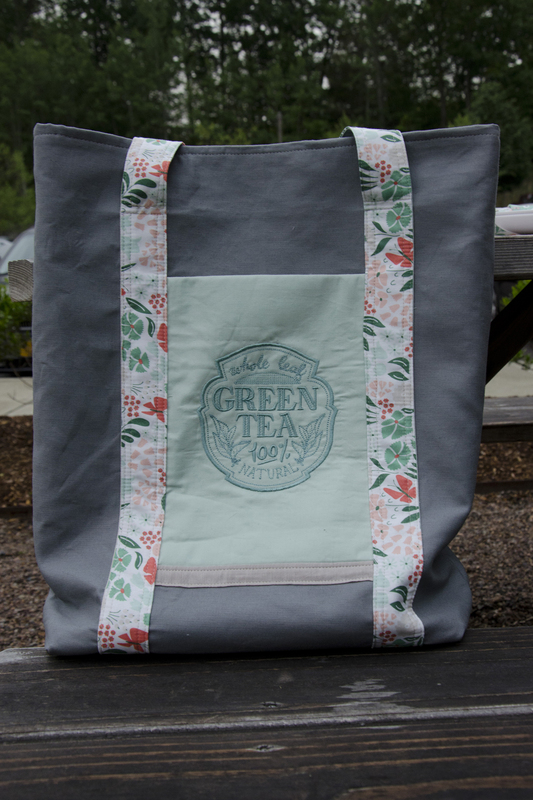 Using the Art Student Tote as a general design guide, I pulled together a bag made of dark gray Essex Linen, straps in a Park Life print, and a machine embroidered pocket using a coordinating solid from my stash and one of the tea embroideries from the bunting. 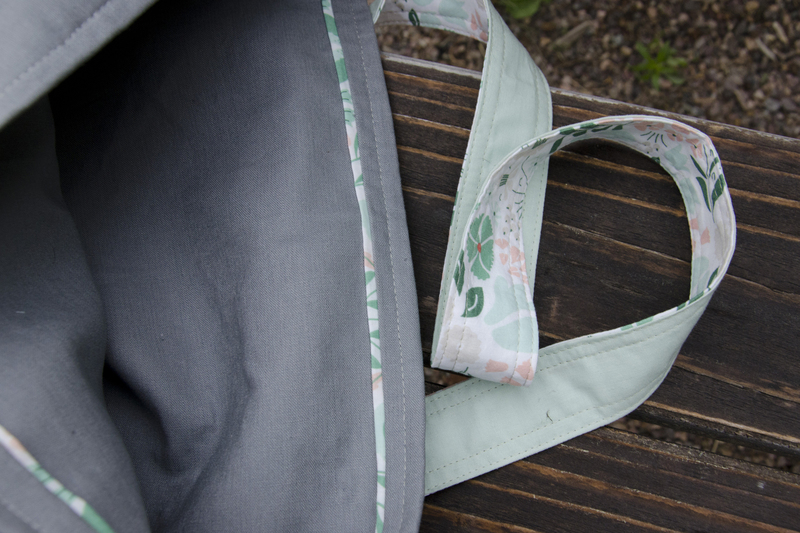 The bag is 13″x18″x4″—a hybrid of the two Art Student Tote sizes. 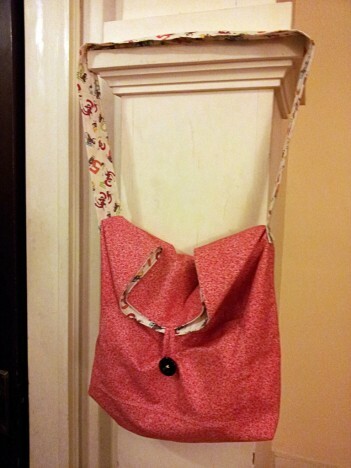 I only added one pocket to the front, no closures, and no interior dividers/pockets. Since I lined it in the exterior linen, I modified the construction a little bit and added a flange for a pop of color around the top of the interior. Having learned from using my own Art Student Tote, I made sure to use a woven interfacing for the straps—mine are starting to stretch out and warp due to the medium-weight non-woven—and cut an extra strip to get the full suggested 128″ instead of the approximate three widths of fabric—mine are a smidgen short when the bag is loaded up. I also modified the strap construction to use two different fabrics (one on each side), as I didn’t have enough of any one fabric. 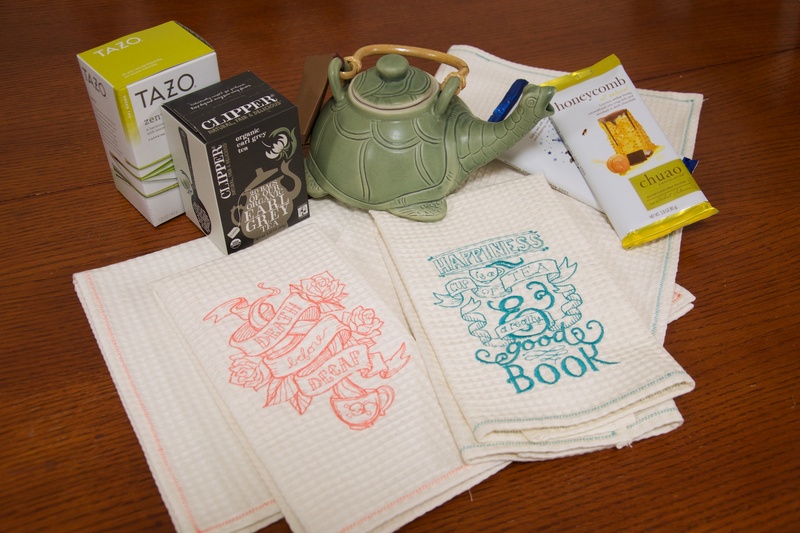 To round out the picnic theme, I added a few store-bought gifts as well. It was a dreary, rainy day when I tried to take photos before shipping it off. I hope the couple has many sunny days in their future. Even with this whole package, I still have a quarter yard of five of the prints—and a few more triangles—but for now I’ll retire that to the depths of my stash and move on to some other things! My sister’s bridal shower is fast approaching, and we’re planning it with a tea party theme. (The whole concept of what one does at a bridal shower is a bit of a mystery to me, having not been given one when I married, nor having attended any for others.) Seeing as I’m 1,300 miles away, my ‘hosting’ status is mostly honorary, but I am able to lend a hand with the decorations. 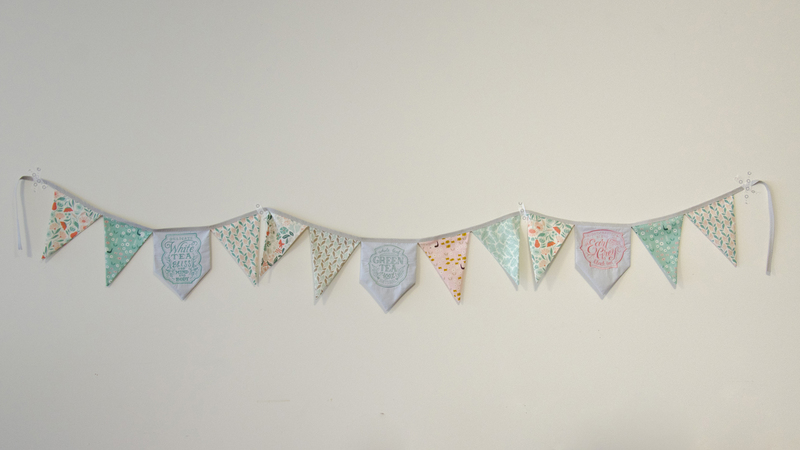 Armed with a few embroidery files from Urban Threads and some half-yard cuts of Park Life by Elizabeth Olwen for Cloud9 Fabrics, I whipped up bunting for the party. Where by whipped, I mean I spent a lot of time at my machine over the course of a week or so, considering the 40 minute stitch out time of each of the embroideries. I dare say the final result is pretty sweet. I made two of these strands, each 9’ long. Here are a few tricks I found helped with creating it. When making your own, you can actually get a lot more bunting out of just a quarter yard of each fabric than I ended up making—my cut triangles had 7” bases and were 9” tall. I have so much fabric left over—stay tuned for future projects with it. 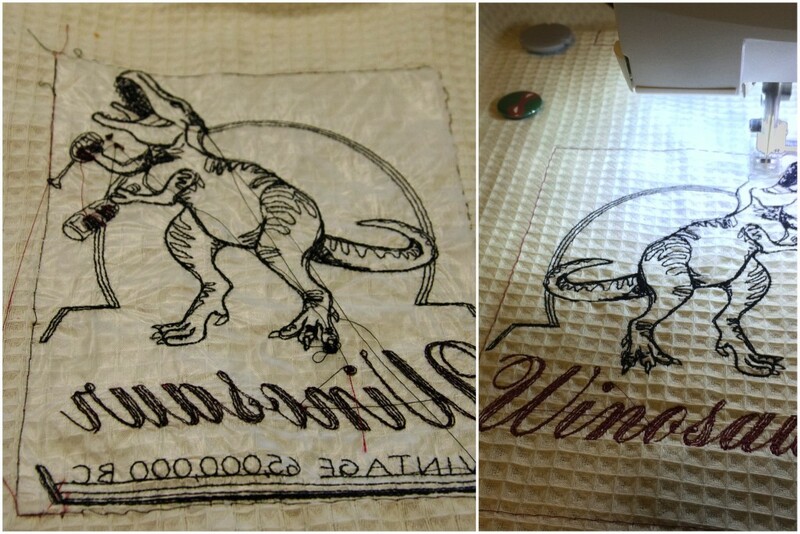 Cut strips of fabric, then rotate your template (or cutting marks) for easy cutting. 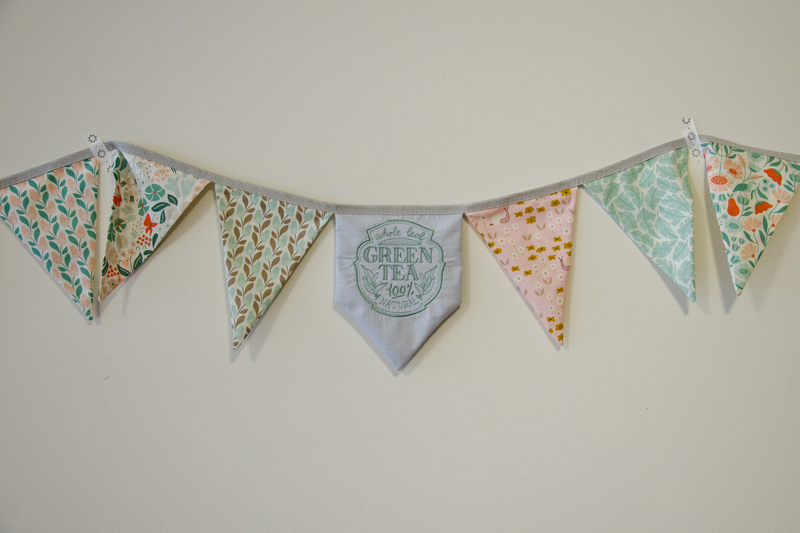 If your fabric is directional, you can use the upside-down cuts on the back of your pennants. Trim the seam allowances and use a chopstick to turn the point. I’m not great at sharp points, regardless of how I trim the seam allowances, but the chopstick is awesome. Cut a template out of card stock to help with pressing. If you cut the template to the finished size, then slide it in with the seam allowances behind it, you get a nice sharp edge to your pressed pennants. Use packaged double fold bias tape for a quick and easy finish, and a glue stick to hold everything in place while you sew the flags down. Best of luck in your bunting endeavors! I’m absolutely the worst at remembering to pop gifts in the mail on time for my various niblings’ birthdays. I think they’ve all come to expect that Aunt Rachael’s cards come sometime in the general month, likely mailed on their birthday or a few days after. Take these, for instance. Two of my nieces recently celebrated their 16th birthdays, one this past week, the other in September (to be fair, I didn’t have a mailing address at the time). Charming lace key keychains, November 2014, Rachael Arnold. 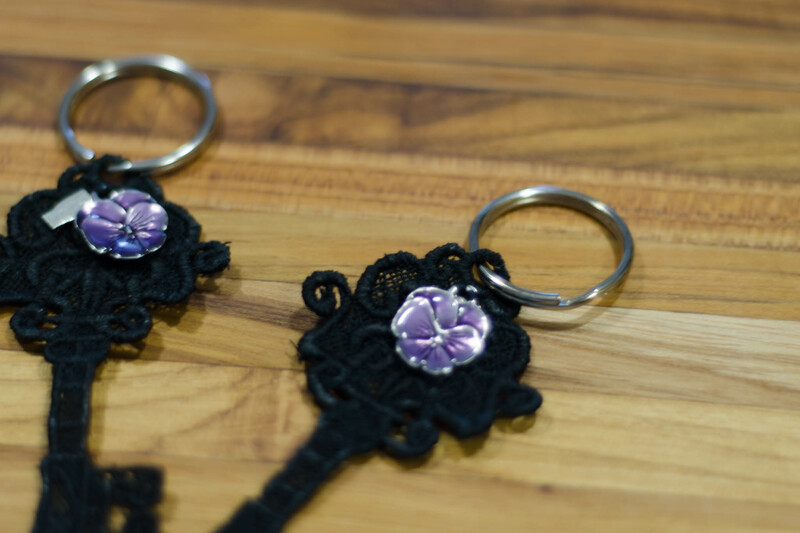 For birthdays, I usually drop a gift card in the mail, but since this was a special one, I added a small additional gift as well—a keychain composed of a free-standing lace design from Urban Threads and a pair of charms from Danforth Pewter (made here in Vermont). 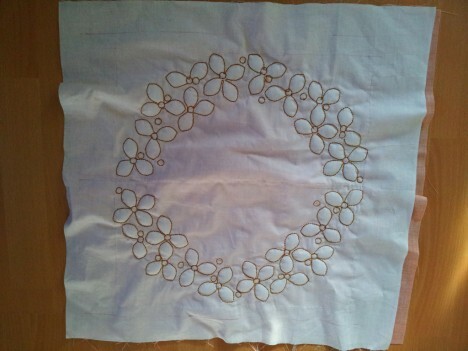 This is the first time I’ve tried stitching out a free-standing lace design, and it was a little rocky. My first attempt failed compeltely. The second time, I doubled up the water-soluble stabilizer and it turned out okay but the top thread broke about ten times, and it skipped a ton of stitches. The final product seems okay, despite all that. There are quite a few skipped stitches in this area. 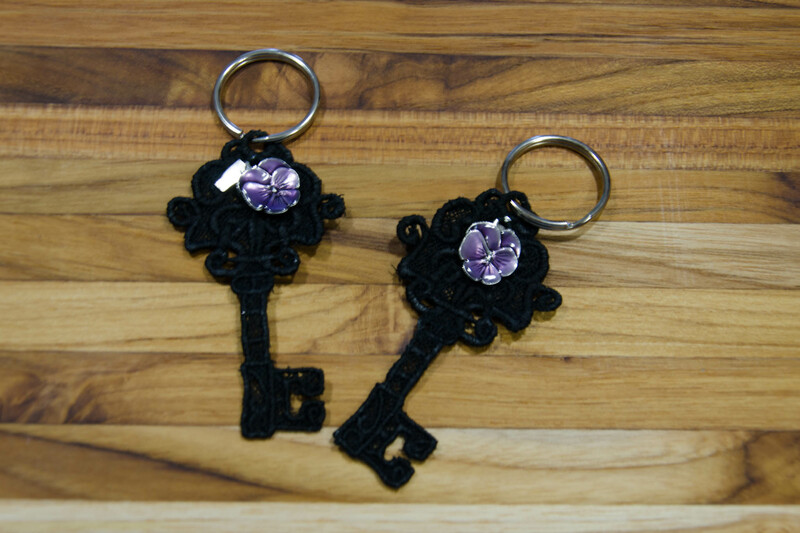 The third time, I used three layers of stabilizer, and didn’t have to fight broken thread, however the stitches pulled the stabilizer apart, scrunching and mis-stitching a part of the key. It still came out okay, but I definitely have room for improvement. Now I just need to remember to make it to the post office tomorrow to send them on their way! Have you had much experience stitching out free-standing lace designs? A group of us are starting a Modern Quilt Guild here in Vermont. 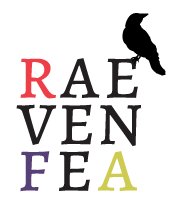 It’s very exciting, but also a bit drudging trying to get everything set up and official and to get the ball rolling with actual guild-type stuff rather than being all about business, business, business, and “do we want to be MQG-official?”, et cetera. At our September meeting, we had our first demo, potholders based on the ones in Zakka Style—a great demo idea, since it shows all the steps of quilting in one small package. 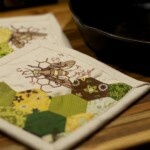 To encourage members to try out the skills and techniques, we’re charged with bringing a completed potholder of any type to the next meeting. 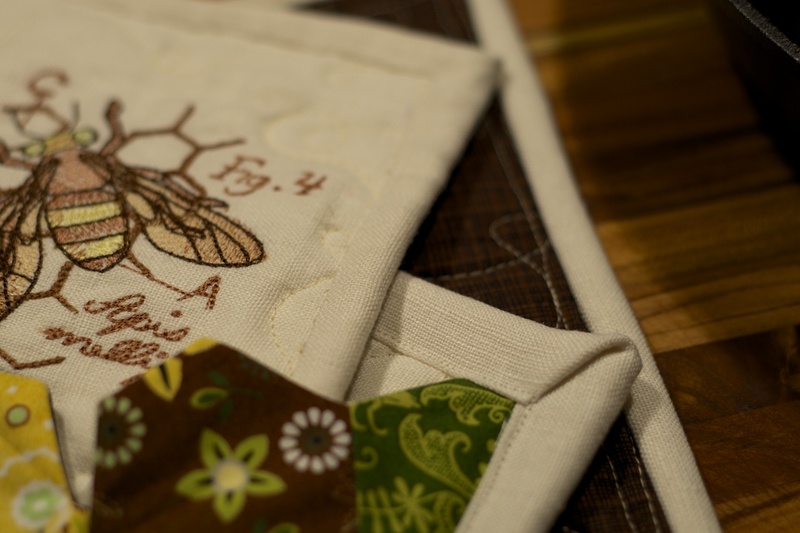 Bee Potholders, Rachael Arnold, October 2014. I thought I should tackle two to-do items at once and get a head start on xmas gifts, so I made a matching set for a friend. I’ve been saving a charm pack of BasicGrey Origins for almost three years now, purchased with this friend in mind. I paired it with stashed ivory linen, a brown texture print from JoAnn Fabrics (I had nothing in my stash that matched the linen and charms. Amazing! ), and an embroidery from Urban Threads. After I finished, I remembered that we said we’d do a swap at the meeting, so I made a third for that (a great time to incorporate what I learned from earlier mistakes!). 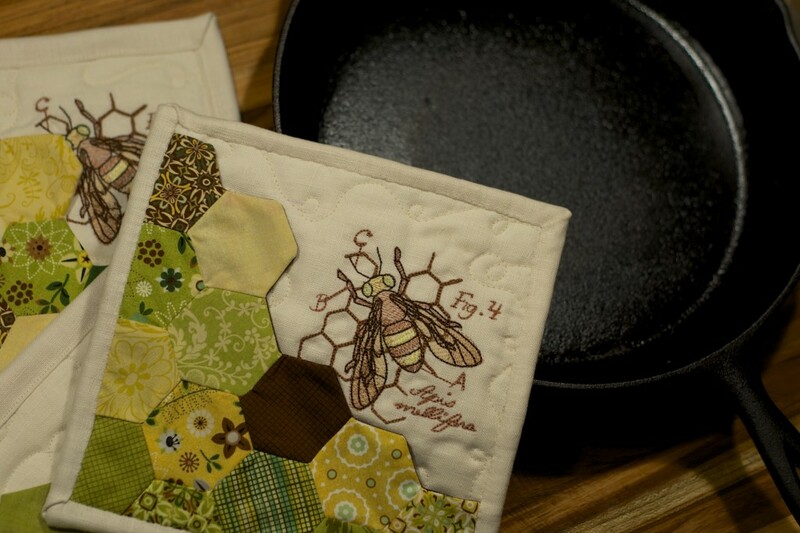 Bee Potholders, Rachael Arnold, October 2014. Photo by Carl Pfranger. That time around, I cut the binding as a 2.5″ strip instead of the 3″ that I used for the other two, since I wasn’t entirely happy with the width. Next time, I know to use 2.75″; 2.5″ is slightly too narrow for me to machine finish cleanly. 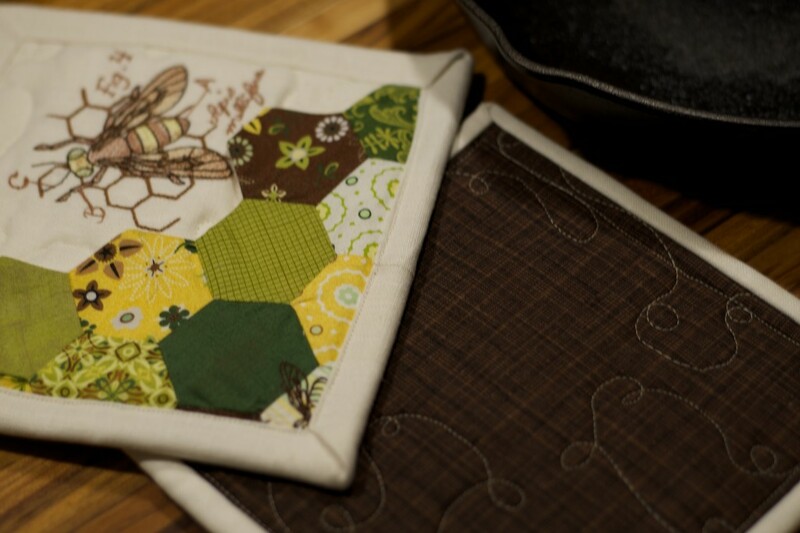 I pieced the 2.5″ hexies by machine (not perfect, but nothing a liberal amount of steam couldn’t handle), and turned them into a pouch for better gripping (making the pretty side the won’t-get-shoved-into-food-accidentally side, which makes the ivory far more practical). All three are 8.5″ square, with a layer of Insul-Bright and low-loft cotton batting between. I do wish I’d remembered to add a hanging loop to my friend’s, and am not entirely happy with the contrast quilting on the back (which makes the un-quilted, embroidered area even more obvious). 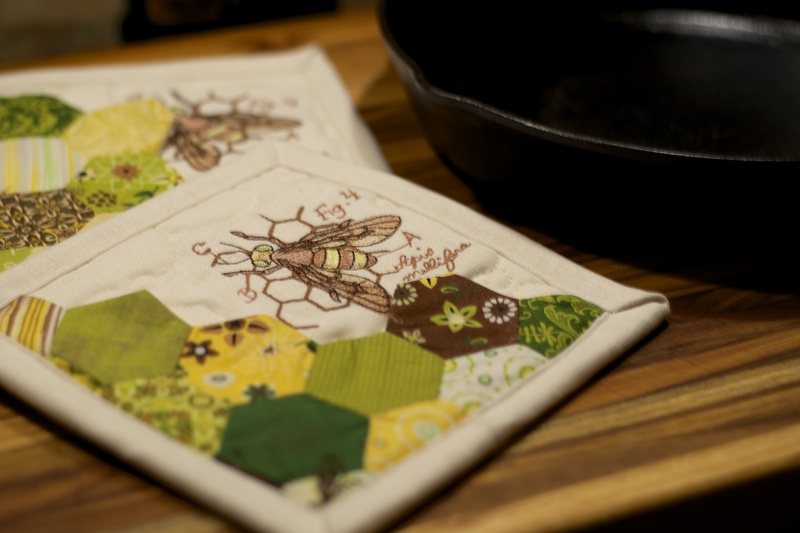 Bee Potholders, Rachael Arnold, October 2014. Delicious potstickers cooking in background are based on this recipe. A huge hit in the Arnold+Pfranger house! As for the guild, join us the last Sunday of every month, 10am-noon, at Nido in Burlington! Near the end of every semester, I send finals week care packages to my younger sisters (which also happens to conveniently fall near their birthdays in the spring and autumn). While they mainly contain tea, chocolate, pens/markers, post-its, and something relaxing, I try to slip in something me-made every time as well (to varying degrees of success). 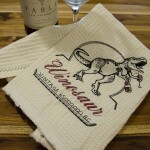 This semester, they moved into an apartment together, so I thought of the perfect gift: a set of kitchen towels with awesome embroideries that I found on Urban Threads. Useful, not so precious that they can’t be used, and amusing. 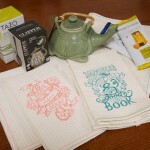 Here they are pictured with the aforementioned chocolate, tea, and the elder’s birthday present. I made the four towels from a yard of textured cotton I found in the utility section of JoAnn Fabrics. While not explicitly labeled toweling, it’s a great texture for a hand towel. 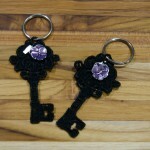 I used cotton Gutermann thread to embroider them, matching the needle and bobbin threads. The 150m spools had just enough thread on them to get through the embroidery, then I switched the bobbin up to feed through the needle and put a cream bobbin to hem the edges. It made for an efficient use of a single spool that could have ended with a run to the store had anything gone wrong (I like to live a little dangerously some times). To be fair, it’s because I’m trying to reorganize everything and had just removed the desk that served as my cutting table to make way for a new cutting table with storage (also known as a dresser), a new bookshelf, and a new desk for my sewing machine (anyone want a Singer Touch and Sew c. 1976? It needs service, but it comes built into a desk and has all its parts to the best of my knowledge. Free to anyone willing to cart it away from my house in Utica, NY. Ferris? Bueller?). 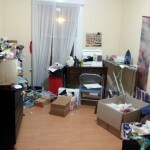 But, it was quite a mess to begin with and really has been for about 9 months since I originally set it all up. In that time, I’ve found some things that work, and some that don’t, so this week seems like a good time to start over, particularly because I’m sort of in-between projects and bouts of creativity (I do have projects that my brain wants me to be working on, but artistic me just isn’t feeling them). In the past few weeks of non-posting, I’ve only made a couple of things. One was a present for my friend’s son, which in now late and still not mailed. I decided to pull the embroidery unit out for it. 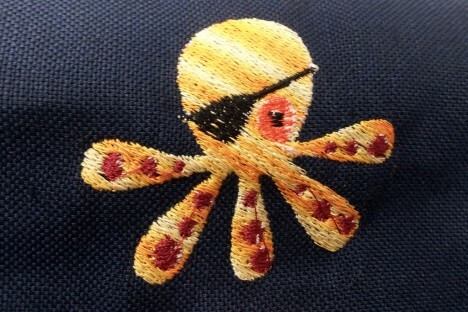 I downloaded this free (at the time) Pirate Octopus from Daily Embroidery a while back, and thought it was perfect. 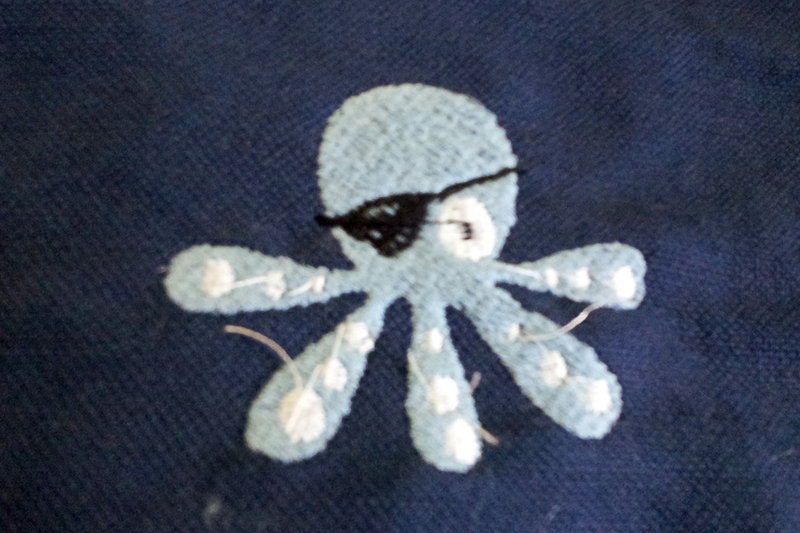 Because I don’t entirely trust designs I find on the internet, I stitched out a sample on a scrap. Awesome (ignoring the jump stitches I didn’t snip cleanly). 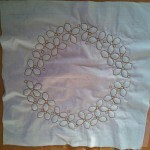 The final one is in different colors (but same thread types). 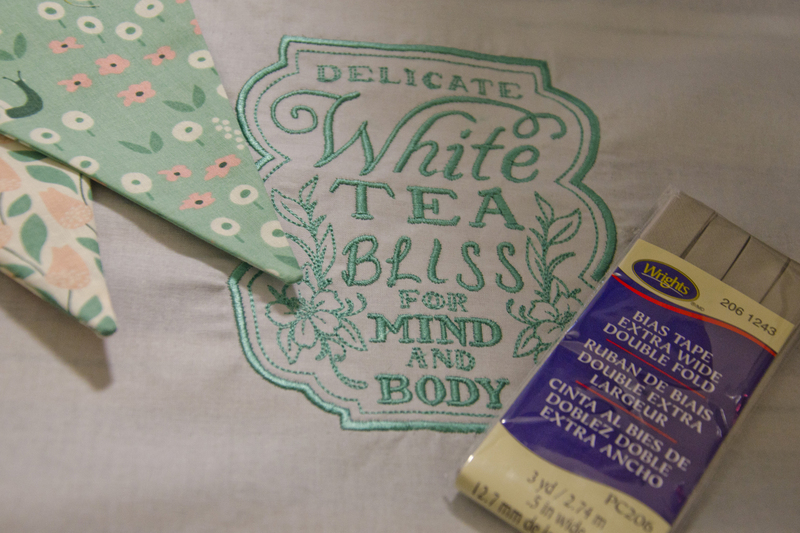 It is stitched directly onto the bag. It isn’t nearly as awesome, because when my bobbin ran out halfway through, I grabbed a normal-weight white bobbin, not the spare bobbin-weight one I thought I had. Using bobbin thread really does make a difference—with normal-weight thread, the bobbin threads pulled up in certain areas. Bummer. But, it is ok. I just need to remember to mail it. The last thing I finished is a bag that will be filled with craft supplies for my quilt club’s service project. I made a pattern for them, which I hope to turn into a blog post later this week (I finished the pattern for the club about 30 min. before the meeting yesterday). Now, I need to get everything back in order post haste, because I promised my sister a “Rachael Arnold” zippered bag in lieu of the “Vera Bradley” one she keeps asking our other sister for. Her birthday is tomorrow… I’m a bit behind these days. Late last week, I decided that I needed to actually start using the embroidery features of my machine—I paid a whole lot of money for a machine capable of it, so why haven’t I been using it? (That was rhetorical.) So, I decided to get started. The first step was installing the software that allows my computer to communicate with the sewing machine (including running a couple of updates that were due on the machine itself). Except, Husqvarna Viking (and to my knowledge, every other manufacturer/software suite for embroidery) doesn’t support OSX—it’s all Windows only. I’m a Mac user and have been for years. So, step one was switching back to my old laptop so that I had a working CD drive with which to install things (it’s a really long story about why I have two MacBooks [one is technically Carl’s old one] and switch my hard drive back and forth on occasion, but suffice it to say my priority in machine buying was a fancy sewing machine instead of replacing the two five year old laptops). Then, I had to completely reinstall my operating system. Then I had to find my old copy of Windows XP from when I was in college and had to use Windows sometimes because I was in Computer Science and sometimes that’s not OSX friendly either, and use that to dual boot. So, finally, I have a computer that is running Windows. Then, I installed the software that came with my sewing machine. Or, tried. They gave me a 4D disk (old version) with a 5D (new version) key printed in the User Manual. So, I had to contact their tech support, but while I did, I searched around and found the manual for another model that would have shipped before 5D was released, and used that key (turns out, that is the key that Support later gave me). I still think that I’m being cheated by not being given 5D. They said to use the software update, but that doesn’t show any updates. Maybe it’s because I’m using a 11 year old version of Windows. Finally, I decided to use the USB stick to run the machine updates, instead of directly connecting the laptop (mostly because the laptop’s wireless doesn’t work with our home network [re: one reason for the two laptops], and we only have one ethernet cable in the house—no where near my sewing room). I got that all set up, only to have the sewing machine tell me it needs to connect to the computer, because there’s too much updating needed for the USB stick method. So I did, and now my machine is all updated. Yay. As a result of the above, I did two different embroidery projects this weekend. One was part of a class at the Viking shop—ultimately it is going to be a table mat (or a pillow? ), but for now, I’ve only finished the embroidery part. It was interesting doing trapunto in the hoop. The design and project were free from Viking earlier this year. 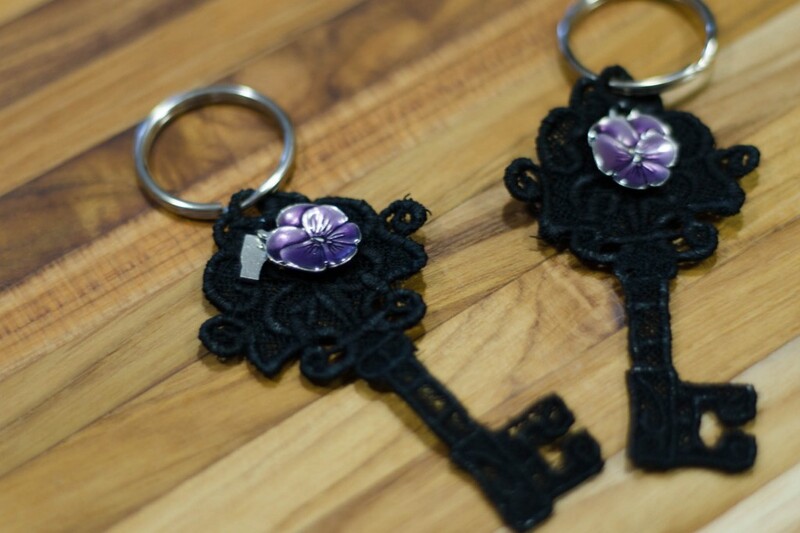 You have to buy the design now, but you can get the pdf instructions for free still. 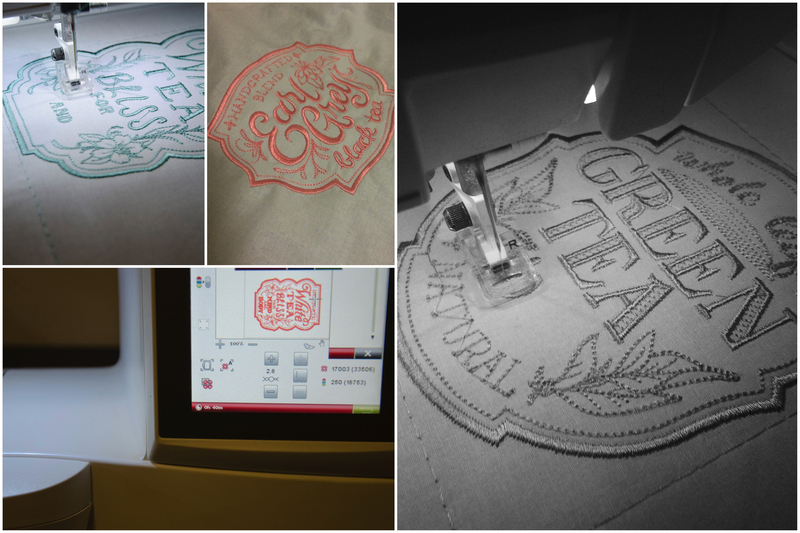 Did you know you can run two colors of thread through the machine? It makes the most interesting color mash in straight line embroidery (the above is a mix of rusty cotton and gold silk). Then, I decided to be exceptionally lazy while working on my latest quilt project (a gift, but I’ll reveal it later this month), so I searched for a free heart outline that I could use as a quilting motif, and let my machine do a fair bit of my quilting for me. This is something I definitely want to explore in the future. 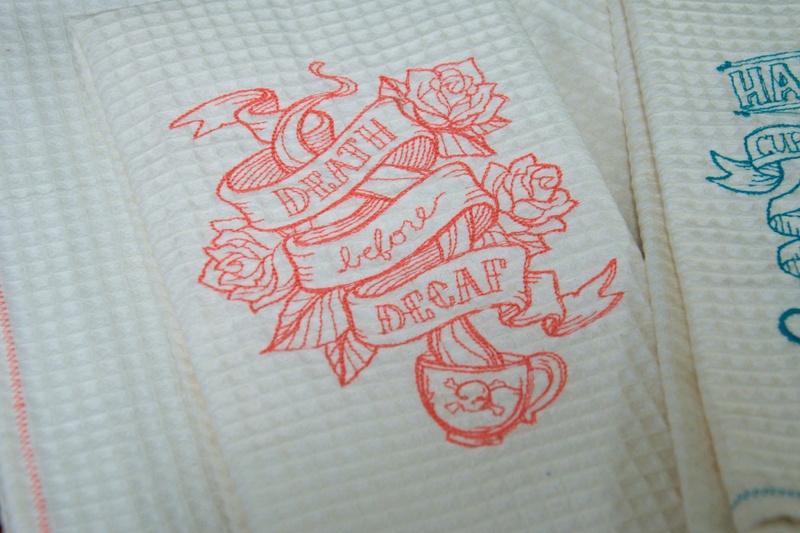 So, hopefully my future embroidery posts will be successes rather than woes. 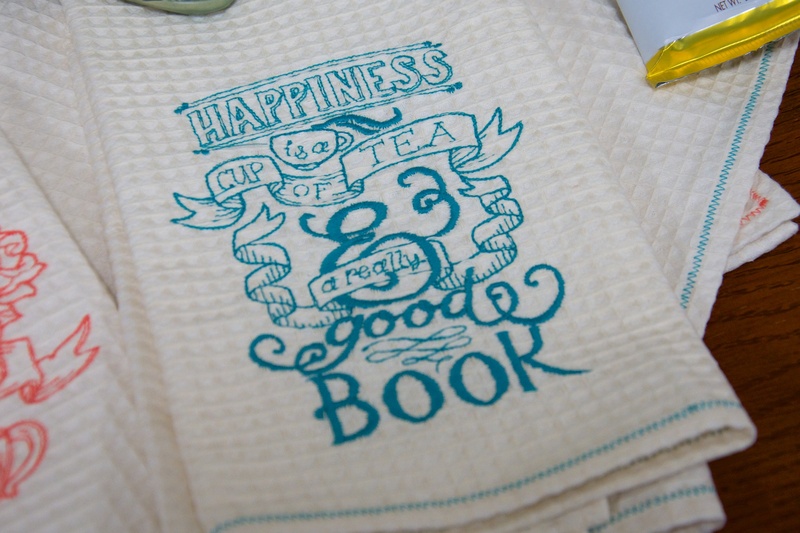 Do you do much machine embroidery? Any tips for this newbie?